My good friend, Thom Powell got some news coverage last week in the Portland Tribune. 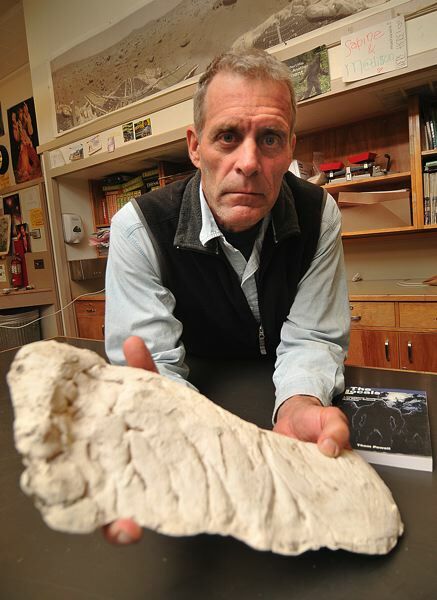 The article focuses on Thom as a science teacher and how he is also interested in bigfoot. Go figure, bigfoot and science go hand in hand? Yes, they do. While Thom is known for being on the outside of the mainstream of bigfooting, if a "mainstream of bigfooting" can even exist, he has arrived there by applying the scientific method to ideas not normally considered. He finds a hypothesis that he likes and does small experiments to see if it's correct. Sometimes it is, sometimes it isn't, but he always revises his thought and moves to the next one. While I don't necessarily agree with all aspects of Thom's picture of bigfoot, I really like the man and respect where he's coming from. I'm glad he's doing the things he's into because, as Thom himself would say, that means that I don't have to. A few months into one’s freshman year at Wilson High School, alumni of Jackson Middle School in West Portland Park will start forming friendships with those of Robert Gray in Hillsdale. They will trade stories of their middle school years, recounting horrific homework assignments and raving about favorite former teachers. But while former Jackson pupils tend to have a long and varied list, Robert Gray alums all seem to name the same one: Mr. Powell, a teacher of eighth-grade science with a penchant for Sasquatch. Not the annual music festival, but the mythical creature also known as Bigfoot. Thom Powell has taught at Robert Gray Middle School for nearly three decades. He is a tall, gray man with a raspy voice and a disarmingly piercing gaze. Though his appearance is domineering and almost off-putting, his students know better. They flock to his classroom as soon as the bell rings, vying for his attention to their preteen attempts at sarcasm and deadpan. Powell meets them bit for bit, speaking with complete candor to his 14-year-old pupils. Truly, he is a gentle giant, and so, he says, is the Sasquatch. Click here to read the full article posted at Thom's blog. Go figure, bigfoot and science go hand in hand? Yes the do. I fixed the first error, but the "gray man" part is directly from the article. Thank you for noticing errors, as I am prone to making them. Loved this, I am totally getting lost in reading his blog and yours, thanks for all the good reads. Wow! Go figure, people making fake footprints. Well this article was very interesting, I very much enjoy reading your blog. I as a young aspiring bigfooter would definitely like some advice on how to do it right, and what to look for in Bigfoot tracks, and how to tell if they are real or not.